McLaren's Fernando Alonso competes during the US Grand Prix Circuit of the Americas in Austin, Texas. 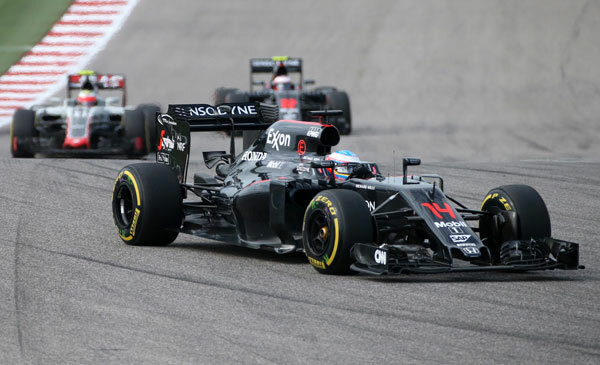 Chinese investors are seeking to buy a controlling stake in the UK-based McLaren Formula One racing team's parent company, McLaren Technology, analysts and insiders said. They said the 1.9 billion pound ($2.36 billion) hostile bid, from an unidentified group of Chinese investors, was presented last week to the company's Middle Eastern owners by Ron Dennis, chairman and chief executive officer for 35 years, who was dismissed on Tuesday. Dennis, who is believed to back the Chinese bid, was subsequently ousted after he failed in a legal bid to prevent him being sent on compulsory leave ahead of the end of his contract in January. TAG, a Luxembourg investment group run by Mansour Ojjeh, which has a 25 percent stake, and Mumtalakat, the Bahrain sovereign wealth fund that has a 50 percent stake, voted also on Tuesday to remove Dennis, who started his career as a mechanic for the Cooper Formula One team in 1966. Dennis, who still retains a 25 percent stake in McLaren, is a member of China's Minsheng Investment Fund's global advisory council. The fund is a leading international private investment group founded in Shanghai on Aug 21, 2014 with registered capital of 50 billion yuan ($7.27 billion). It paid 180 million pounds earlier this year for 55 Bishopsgate, an office building in the heart of London's financial district. "There is no doubt the Chinese bid, which is very real, is behind all this. The Bahrainis don't want to sell and that's what caused the problem," said one person involved in Formula One, who requested anonymity. The Chinese offer, believed to have been made by an asset manager and a private equity group, still remains live, analysts say. Earlier this year the Financial Times reported that US technology giant Apple was in talks with McLaren but that came to nothing. The Chinese bid values the company at twice its annual revenues and includes provision for funds to build a new technology center at McLaren's headquarters near Woking, in the southern English county of Surrey. During Dennis's tenure at McLaren, the team won 158 Grands Prix and seven World Constructors' championships. Drivers who raced during his time there include Alain Prost, Nikki Lauda, Ayrton-Senna, Fernando Alonso, Jenson Button and the current World Champion Lewis Hamilton, who now races for Mercedes. Chinese interest in Formula One motorsport dates from 2004, when the first Chinese Grand Prix was staged at a purpose-built track at Jiading, near Shanghai. The Chinese Grand Prix is now a firm fixture on the international calendar.